to recover from an automobile accident. The Mission Arts building where 5Z'S is located. 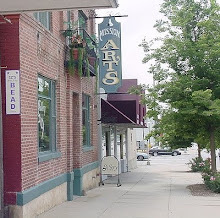 The Entrance is just to the right of the Mission ARTS sign. The purpose of 5Z'S Star City Bead Shop is to provide an avenue for Beading, Designing, Teaching and Helping people to realize their dreams, especially the ones that involve beading. 5Z'S has been in existence since August of 1999. It started out of my home. Then, in 2002 the shop moved to its present location. It is located in a building that has an art gallery and various art studios. It is such a joy to have all this art "Eye Candy" around me. Other than my family, my greatest joy is my shop.